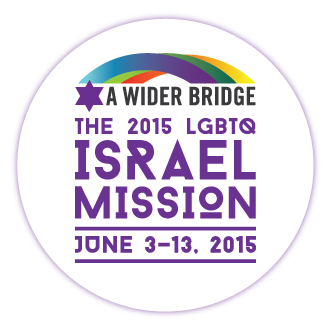 Join A Wider Bridge for our 5th annual LGBTQ Mission to Israel, June 3 to 13, 2015! 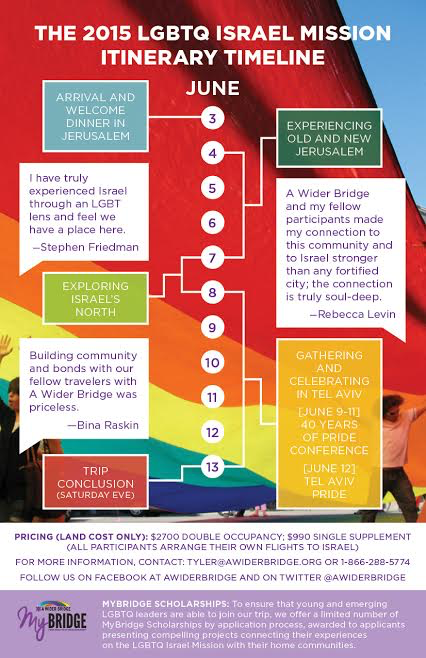 Our unique trip brings together an incredible and diverse group of leaders – lesbian, gay, bisexual, trans and queer (LGBTQ) people and allies, Jews and non-Jews. Through shared experience, the trip connects modern Israeli and LGBTQ life with the ancient roots of its people. 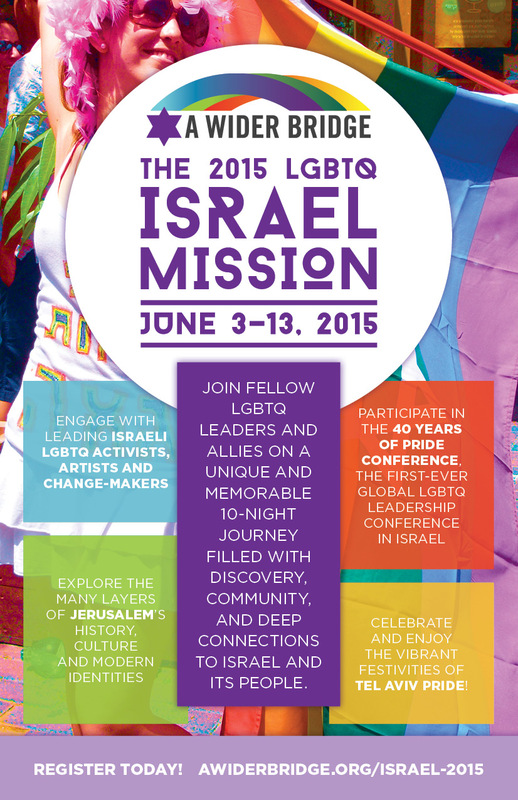 Our 10-night journey takes us to the desert, Jerusalem, and finally to Tel Aviv for the LGBTQ – 40 Years of Pride Conference, the first of its kind gathering of LGBTQ leaders from around the world to be held in Tel Aviv, and then culminating with Tel Aviv’s amazing Pride Weekend Celebration. 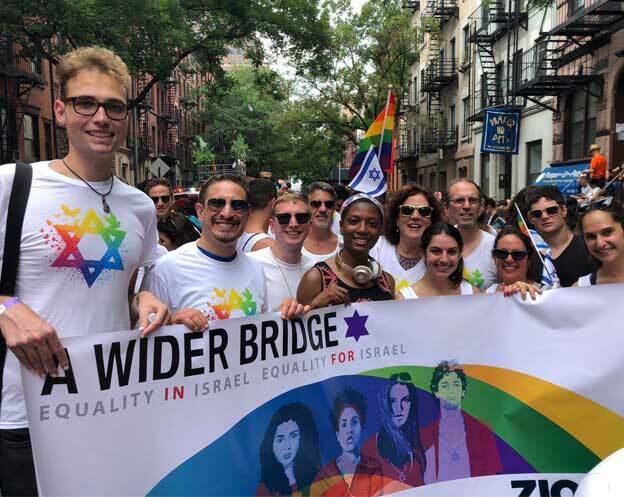 Get acquainted with the leadership of Israel’s most significant LGBTQ organizations, each at the forefront of cutting edge change in Israeli society. Meet prominent Israeli LGBTQ people from all walks of life – religious and secular – from politics, activism, culture, music, film and much more! Together we’ll relive Israel’s history – from the ancient ruins of Masada, to the spiritual and diverse Old City of Jerusalem, along with visits to the more recent institutions that tell the inspiring story of the modern State of Israel and its founders. We’ll also meet organizations and people building the future of modern Israel – a country thriving as a diverse and urban high-tech powerhouse and research superpower, yet brimming with domestic and foreign challenges and contradictions. And no LGBTQ mission would be complete without savoring the culture and nightlife of Tel Aviv, consistently rated one of the leading LGBTQ cities of the world! Tel Aviv Pride will surely be a weekend to remember. — Gathering and Celebrating in Tel Aviv — June 8 – 13. — Trip Conclusion — Saturday evening, June 13.